Welding fume extraction equipment from Envirox is specifically designed to ensure cleaner, healthier work spaces and workplaces. High quality welding fume extraction solutions safe guard welding personnel from too much exposure to dangerous and toxic welding fumes and gases. 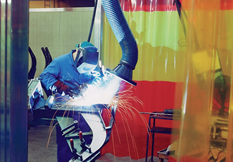 Inadequate welding fume extraction poses many short- and long-term health risks. Many substances found in welding fumes can be toxic. Some of the more severe long-term risks of insufficient welding fume extraction include higher cancer risk in lungs, voicebox or urinary tract. Chronic lung problems can develop and affected organs can also include heart, skin, intestine, stomach and kidneys. Short-term dangers of fume inhalation include metal fume fever, bronchitis, slow digestion, cramps and nausea to name only a few. In addition to potential personnel health dangers, welding fume particulate settles on work spaces when the air cools. It infiltrates machinery and electronics, which ultimately results in additional maintenance and overhead costs. 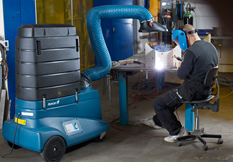 Discover how much our welding fume extraction equipment will benefit your workspace. Fill out the enquiry form to find out how. Our dust collectors are ideal for filtering the dusts, particles, fumes and vapours of industrial production. A variety of volumes and sizes make up our range of dust collectors for welding fume and thermal cutting extraction. Our dust collector range also caters for hot gas and high temperature, and general and combustible dust applications. Our extraction arms, available for normal and combustible dust extraction, extract dust at the source making them ideal for most welding applications. The Ex range is tailored for explosive environments 21, 22, 1/21 & 2/22, and the entire range has airflows from 600 – 1 900 m³/h. Standard with arm lengths are 2 – 5 m, and wall, roof, extension brackets and rail mountings attachments are available. 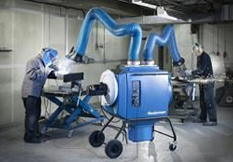 Envirox distributes and installs a range of extraction fans tailored for welding fume extraction. The N series offers portable fans ideal for confined or enclosed spaces; the NCF and NCF Dx (combustible dust applications) range of fans for fume extraction have high working temperatures and operate in low to very high ambient temperatures; the Combifab fan range is for heavy duty and high airflow applications, also available in normal and ATEX versions. Filter box and filter cart dust collectors form Envirox’s range of mobile dust collectors used for welding fume extraction. They are tailor-made for capturing and eliminating welding fumes and dust from industrial and hygiene-sensitive workplaces. Compact with cleanable filters allow for reduced operating costs and safe fume and dust disposal, improving working conditions and worker health and safety. On Torch extraction allows for fume extraction at source, which is the most effective extraction method for capturing and removing welding fumes. It minimises the number of hazards to which welders and personnel are exposed, reducing many of the dangers associated with welding fumes. Envirox supplies a number of Nederman nozzles that fit to existing welding torches, which makes it possible to conduct ‘on torch’ welding fume extraction. Improve the quality of your working environment. Get welding fume extraction solutions from Envirox. Complete the enquiry form for more info. As a South African supplier of dust and air filtration solutions, including solutions for welding fume extraction, Enviroxsupplies, installs and services products that improve the working environment, reduce environmental impact and increase efficiency. Envirox filtration solutions contribute to cleaner and healthier work spaces and workplaces, contributing to workplace proficiency. Contact Envirox today for information on our welding fume extraction products. Call us on +27 11 397 5426 or complete the enquiry form.